What Are the Adaptations a Lizard Has That Allow It to Live in the Desert? 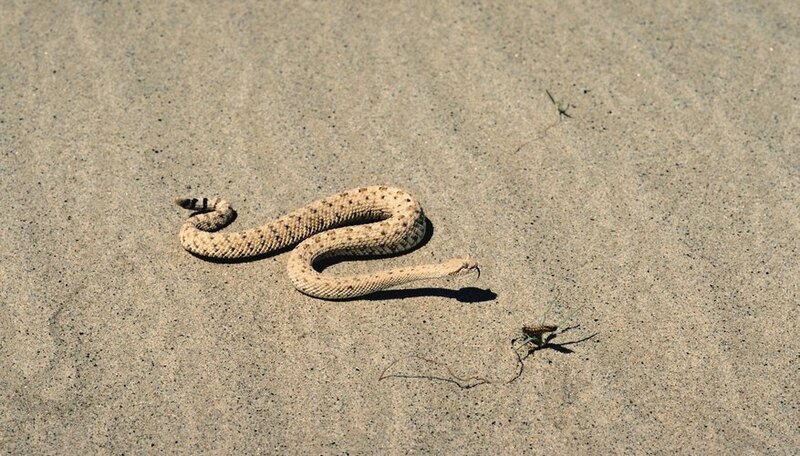 California's Death Valley is one of the hottest places on earth, and it's also one of the best places to see a sidewinder snake (Crotalus cerastes). Visitors to low-lying deserts are often struck by the sets of parallel marks extending across the pristine sandy surface. It's difficult to understand how a snake could make them, but the mystery clears up when you see a sidewinder making them. The strange method of locomotion is just one of the adaptations that the Mojave sidewinder (Crotalus cerastes cerastes), the Sonoran desert sidewinder (C. c. cercobombus) and the Colorado desert sidewinder (C. c. laterorepens) have developed to survive in the hot, sandy desert. Like all rattlesnakes, the sidewinder prefers to lie in wait for prey rather than pursue it. When a small animal comes close enough, the snake strikes and injects the victim with its potent venom. The snake then follows the animal until it dies and then eats it. For this strategy to work, the sidewinder has to be well camouflaged. 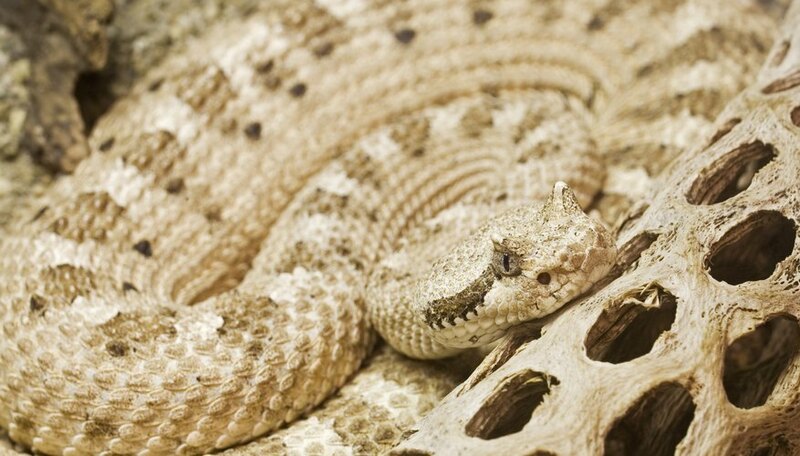 Its overall color is sandy brown, and the elliptical markings, which are a darker shade of yellow or brown, help the snake disappear among the twigs, rocks and other detritus on the desert floor. When the wind starts blowing in the desert, it's difficult to focus your eyes. As a protection against the blowing sand, the sidewinder snake has a protective scale above each of its eyes. 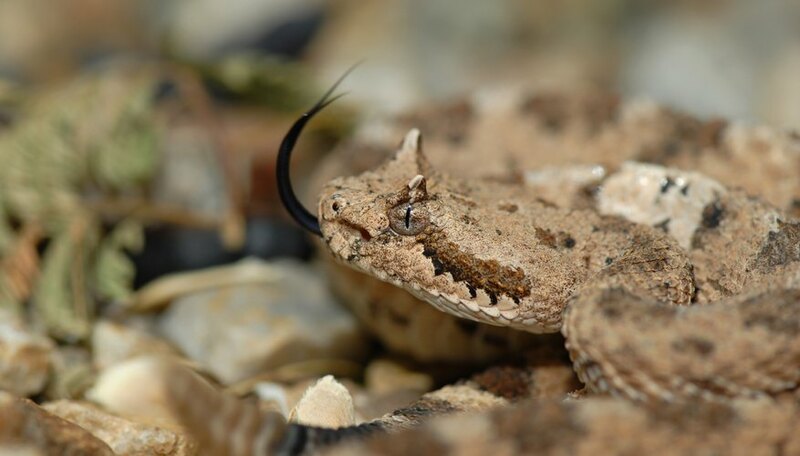 These flaps are shaped like horns and give the snake an alter-ego – the horned rattlesnake. Besides deflecting blowing sand, the horns help protect the reptile's eyes from the harsh desert sun. The snakes is able to fold the scales down over its eyes when it burrows into the sand, thus providing an additional measure of protection from the sandy environment that sidewinder snake inhabits. Moving around in shifting sand can be challenging for a snake, and the sidewinder has developed a curious way of meeting this challenge. Instead of slithering lengthwise by contracting its scales as other snakes do, the sidewinder undulates in such a way that only a small part of its body touches the ground, and it uses the point of contact to lever its body sideways. This movement leaves a characteristic track consisting of a row of parallel J-shaped lines that extend perpendicular to the direction of motion. It's an especially efficient way to navigate sandy slopes. The movement pattern of the sidewinder snake has the added benefit of avoiding full-body contact with the hot desert sand. The motion is analogous to that of a human being running across a hot surface on tiptoes to minimize contact. 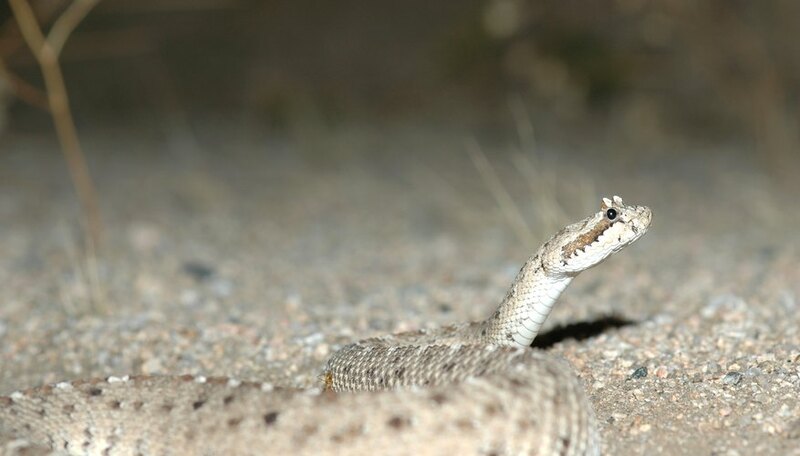 In the desert, any strategy that keeps the body cooler is a good one, and the sidewinding action of Crotalus cerastes helps accomplish that. Even so, sidewinders tend to be nocturnal in the hottest summer weather. Deziel, Chris. "Sidewinder Snake Adaptations." Sciencing, https://sciencing.com/sidewinder-snake-adaptations-6470304.html. 16 August 2018.